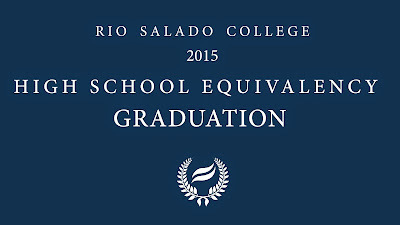 We look forward to the 2015 HSE Graduation ceremony on Thursday, May 21 to celebrate the achievements of students who have successfully completed Rio Salado's High School Equivalency (HSE) Prep program and passed the GED ® test. There's still time to take part in the ceremony. Visit this web page to register. 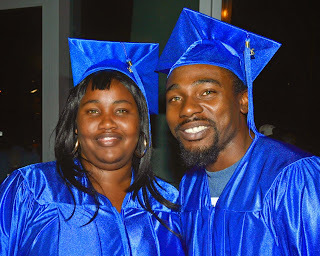 Graduates participating in the ceremony must wear the official college blue gown, cap and 2015 tassel. The $25 graduation fee includes the cost of these items, as well as a diploma cover. Rio Salado staff photographers will be taking photos, which will be posted on our Facebook page for you to upload and tag. Grad Images will also be taking photos during the ceremony, which can be purchased online at gradimages.com in the next few weeks. You will have an opportunity to purchase a DVD copy of the ceremony at the event or by way of email. The cost is $20 and must be paid when ordering. Cash or credit cards will be accepted. Email requests can be made between now and Monday, May 25 by submitting to insitutional.advan@riosalado.edu. A Rio Salado representative will contact you to complete your order. MCTV Cox Channel 115 will be videotaping the ceremony for broadcast, which will be sometime in late May or June. 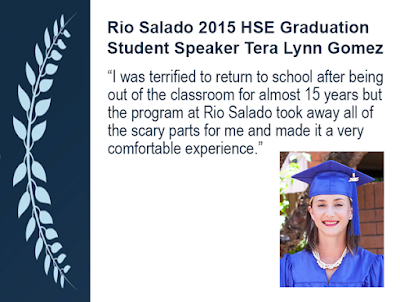 Congratulations to the Rio Salado 2015 HSE Graduates! For more details about Rio Salado’s HSE prep program, GED ® testing services and other college bridge pathway programs and services, visit riosalado.edu/programs/abe or call 480-517-8110.